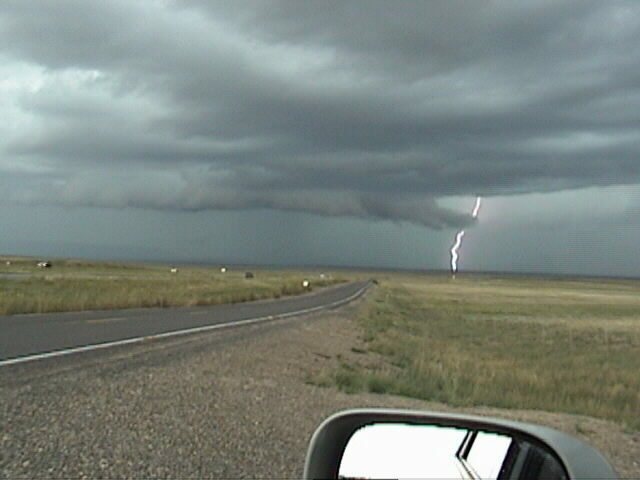 During a trip to New Mexico, Alice and I decided to head out for a chase in the northeast part of the state on August 14. The last in a series of shortwaves was dropping down over northeast New Mexico, and the RUC was predicting CAPE around 1000 and SRH around 200. SPC issued a slight risk for most of New Mexico east of the mountains and along and north of I-40, and both the ABQ NWS hazardous weather outlook and local TV forecasters mentioned the chance of a tornado or two in NE NM. Though we knew the chance of seeing a tornado was not great, I thought we would probably at least have a good chance of seeing a supercell, and even if it turned out to be a bust, northeast New Mexico is always a pleasant place to drive around, with something interesting always waiting around the corner in terms of different terrain or quaint little towns. We left from Santa Fe in the mid-morning and arrived in Las Vegas in time for an early lunch and a little shopping. Even in the morning, there was isolated convection, especially over the mountains, and more moisture and cloud cover than usual. But east of the mountains, it remained largely clear. By early afternoon, the convection over the mountains was intensifying, and it looked like one storm to the north or NNE of Las Vegas was about to move out over the plains. We headed northeast on I-25 for a ways, then exited toward the northwest on route 161 to approach the most impressive-looking storm. I thought it was moving out onto the plains, but we soon found out it was holding back over the mountains. It turned out to be a more or less garden variety storm, though it did produce some nice CG. We stopped and watched the lightning over the mountains along route 442 near Rainsville. Another storm was located to the north, also over the mountains, and was putting out quite a bit of thunder and spreading anvil rain SE onto the high plains. But neither storm had a severe look to it, and neither seemed to be making any big moves toward the plains. Since we needed gas, and the best strategy on the storms seemed to be to head back to the area around I-25 and be prepared to go north or south once the storms began to move out of the mountains, we turned southeast on route 12o at Ocaje, and headed back down to Wagon Mound. Still neither storm was looking too impressive. We arrived in Wagon Mound a little after 3 p.m., got gas, and drove around to look at the town a little. For the first time, I was successful in getting something on the weather radio (there seems to be some gap in NE NM; I had been surprised earlier that I could not get anything in Las Vegas, and the station we picked up from Wagon Mound was based to our east, in Clinton.) There were no watches or warnings, though there was mention of a strong storm in the short-term forecast but in the bad reception I could not get the location. Since we still did not see much visually (the mountains may have obscured some of what was going on to our northwest), we decided to head north and check out a fishing spot I had been curious about near Springer. This turned out to be the best decision of the day! Once we got away from town, it soon became apparent that the storm to the northwest was both getting its act together and making its move onto the plains. Originally, there were two distinct areas of precipiation, one to the northwest near the mountains and another to the north and northeast, more linear along a NW-SE line. This can be readily seen in this radar image from ABX (Albuquerque NWS) at approximately 3:20 p.m.-look at the far northeast edge of the radar image. Between the two areas of precip was a very ragged and nicely back-lit rainfree base, with several small lowerings. CG began to zap down under this, and soon it filled in and what looked like the beginnings of a wall cloud formed where the RFB had been. As the storm began to take on an HP-ish look, I figured we could exit and approach it at the next exit, but by the time we got to it, a few miles into Colfax Co., what had been the eastern area of precipitation sank just far enough south to overtake us and block our view. Suddenly we could see no features whatsoever, as we were in blinding, wind-driven rain blasting us from the NE. However, since this occurred literally within a few hundred feet of the exit, I was able to exit, head back south, and get ahead of it once again. 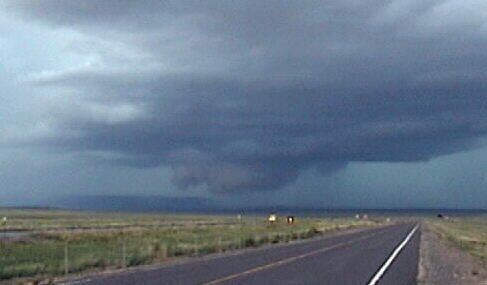 A couple glances to my rear revealed what looked like a wall cloud and the typical HP front-flank meso structure. After ten miles or so we came to the Levy exit, and discovered access to a frontage road that let us edge back north toward the storm without having to use the freeway. 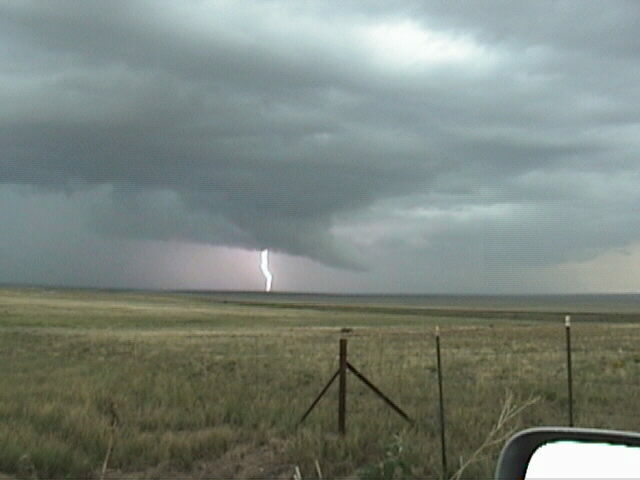 A few miles NNE of Levy, we stopped and I began to get video. There was a small wall cloud and some scud just to its west, which rapidly evolved into one of the largest, most menacing-looking wall clouds I have ever seen. Here is a video capture of the wall cloud, which was given a slightly pinkish tinge by the limited front-lighting it was getting. 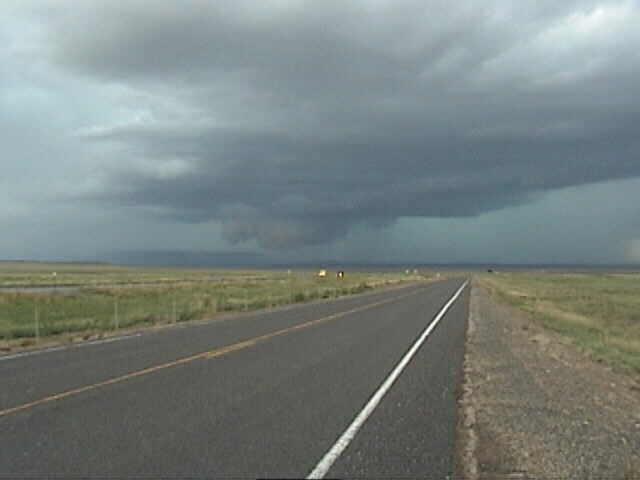 Note also that there appear to be a couple hail shafts right behind the wall cloud. Here is a wider-angle capture of the same feature, showing more of the structure of what had rapidly evolved into a very impressive HP supercell. This radar image from FDX (Cannon AFB) at 3:30 p.m. shows the rapid intensification of the storm to more than 60 DBZ. 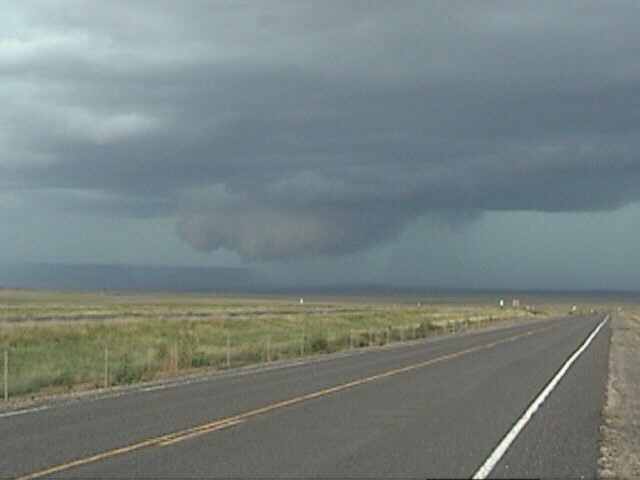 After a few minutes, the storm began to look more outflow dominant, as can be seen in this video capture. 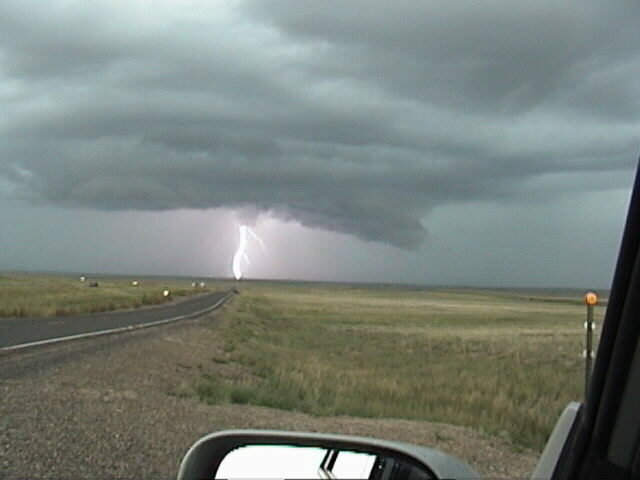 As the picture also shows, this storm was very electrified, producing a great deal of spectacular CG lightning. After a while the storm began again to look less outflow dominant, developing a structure looking more like a wall cloud with an inflow tail. In this video capture, you can see CG lightning coming from a lowering under or behind the wall cloud that was hidden by rain, except when this lightning bolt occurred. 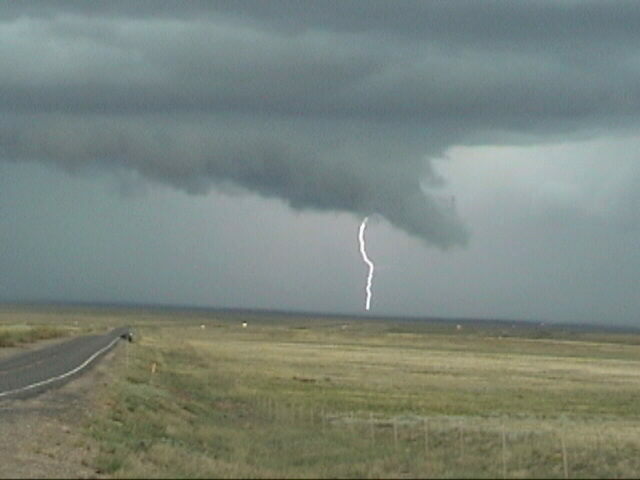 A few minutes later, when I witnessed this CG bolt, the video shows that there was definite rotation in the area to the left of the lightning bolt. This radar image shows the storm at 3:40, larger but slightly weaker than 10 minutes earlier. As this radar suggests, the storm had by now weakened somewhat, but it tried to get its act together one last time, forming a new wall cloud as shown in this capture. Shortly after this was taken, the rain wrapped around the wall cloud and we saw it no more. We cut east to re-intercept the storm east of Wagon Mound, but it was evident that it was weakening, and as we got back into NWR range, we heard that there had been a SVR warning on the storm but that it had just been allowed to expire a minute or two ago at 4:15 p.m. The storm produced penny-sized hail at the Philmont Scout Ranch southwest of Cimmaron at 3:37 p.m., and earlier covered the ground with hail at Eagle Nest while it was still up in the mountains. Two Albuqureque TV stations showed video of the hail in Eagle Nest. Due to the thinly-populated nature of the area the storm passed over, it is likely that it produced hail over a wider area that did not get reported, and it may have produced larger hail as well. Certainly it was one of the more impressive HP supercells I've ever seen, and in New Mexico in August! Total chase distance: approximately 300 miles. A listing of the SVR warning and all of the severe weather statements on this storm can be found here.